Welcome to the second part of my trip report. 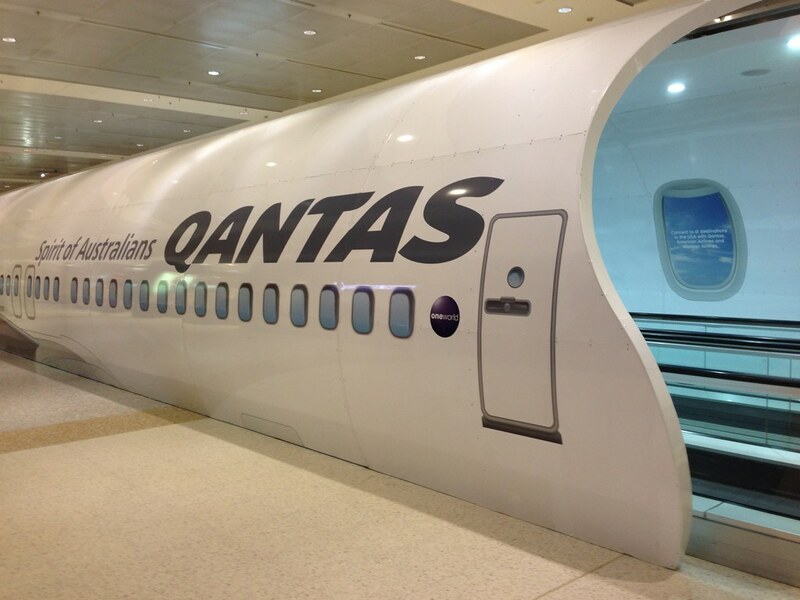 This will cover my return flight from Sydney to Singapore via Perth. 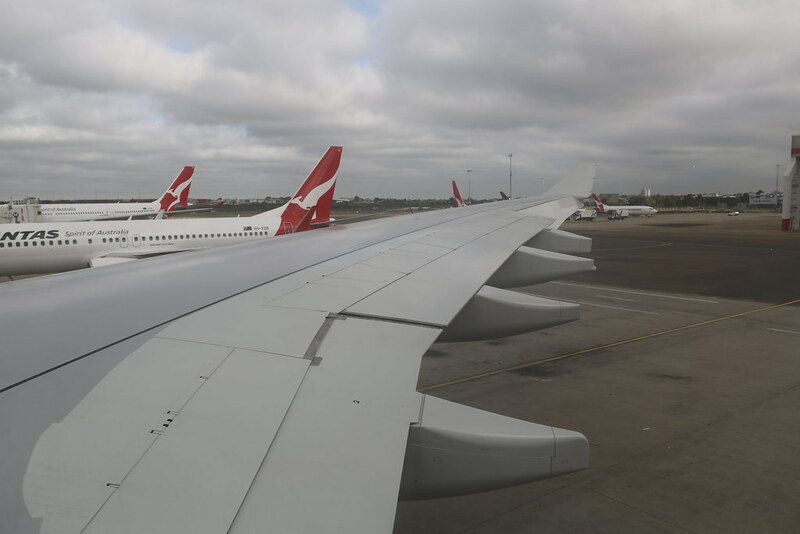 If you missed my outbound flight from Singapore to Sydney please click the link below. I have been living in Singapore for the past 2 years and finally got some time off to visit my family and friends back in Sydney. In the months before my trip I did a comprehensive search to find the perfect combination of when I am free, the airlines and of course price. 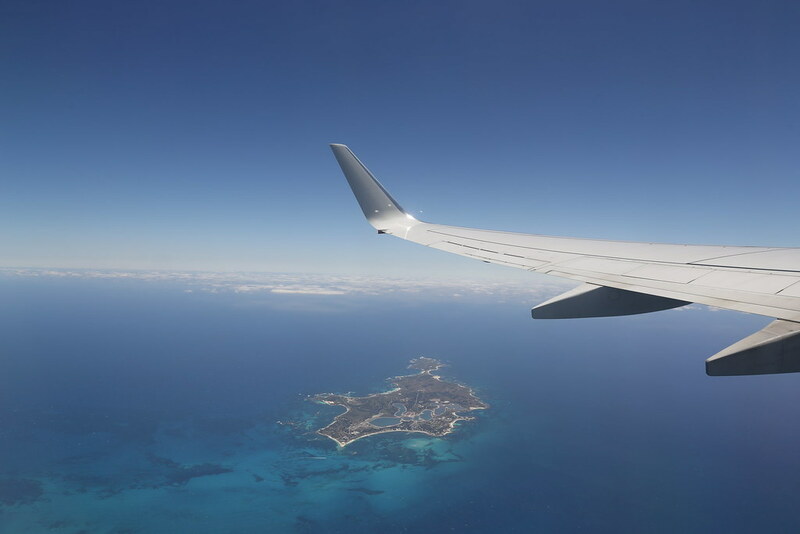 Late November had the best prices and surprisingly Singapore Airlines was the cheapest full service airline. I booked my leave and once that was approved a few days later I went to book my flights. To my disappointment SQ had increased their prices by $300. Time to find a plan B. 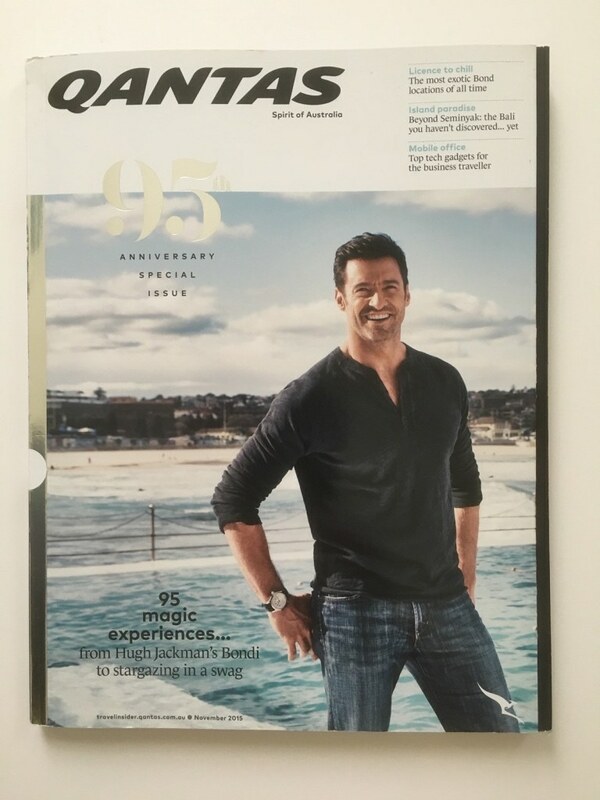 After considering all my options I finally settled with Qantas, as I wanted to try out their new seats on their refurbished A330’s. 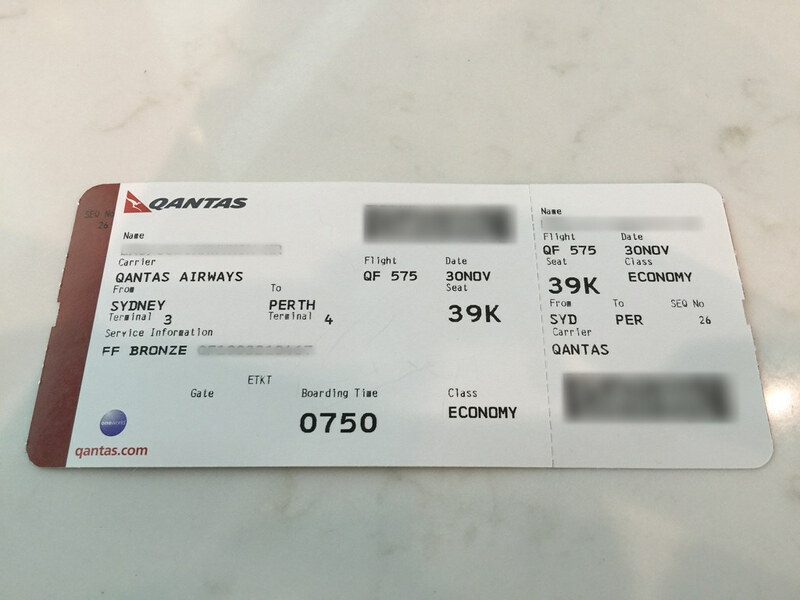 Qantas was also the cheapest “full service” airline to fly to Sydney, when booked under an Emirates flight code. Meaning I wouldn’t get status credits, but I’m nowhere near silver, so that wasn’t a big deal. 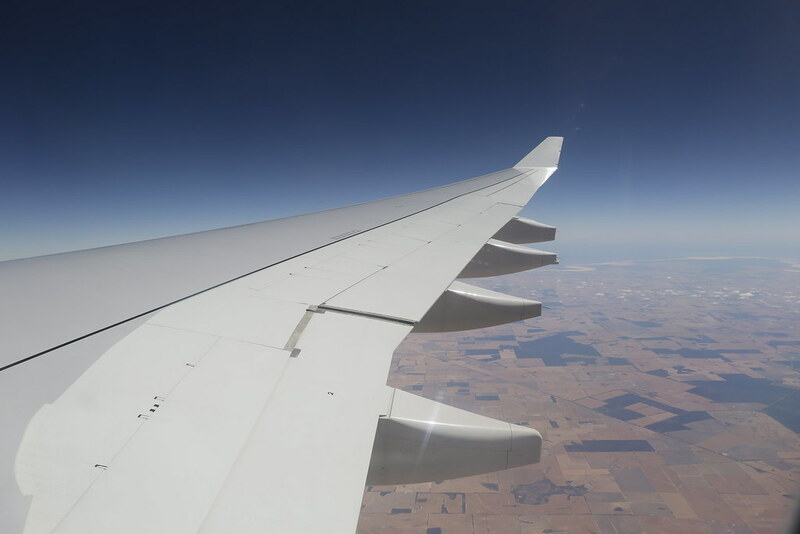 It was also cheaper to fly my return flight via Perth, a recently re-introduced route using a 737 rather then the A330. A week before my flight, I was checking my booking online and realised that the “Select on Q-Eat” option had appeared for my Perth to Singapore flight. A service what you can pre-select your meal and guarantee that selection for your flight. Something not offered on my outbound flight. The day before I was to depart I checked in online, and a system glitch, probably due to my international flight being booked under an Emirates flight number, prevented my from checking into my 2nd flight. This meant I was unable to see my allocated seat. All I could do was hope for the best and pray that the system assigned me my window seat. I had a second chance at trying the new A330 economy seats since I failed at trying them on the international A330’s. Lucky for me the seat map indicated that I would be getting a reconfigured A330 with the new economy and business class seats. Mission accomplished! Driving to the airport the morning of my flight was fairly smooth until I reached the junction to turn into the domestic terminals. The madness of the morning departures caused a long backlog of cars trying to get into the terminals. The traffic lights were timed so poorly that cars could only turn into the complex every other time there was a green light. 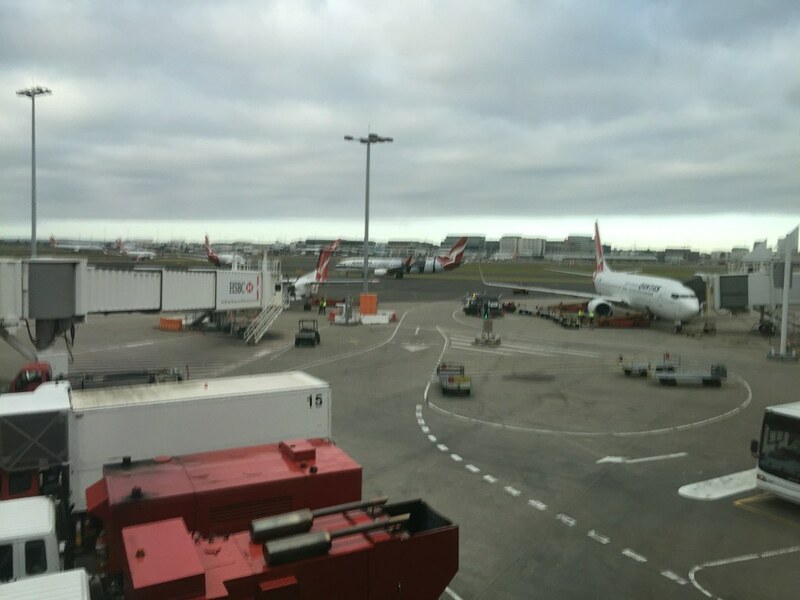 As the departure drop offs for both the domestic terminals were on the same loop, it took a long time to get from Terminal 2 to Terminal 3 where Qantas departs from. It was lucky I still had a lot of time to spare. The international check in counters had been moved to the opposite end of the building since the last time I departed from Terminal 3. The re-location allowed more counters to be used and check in was relatively fast. 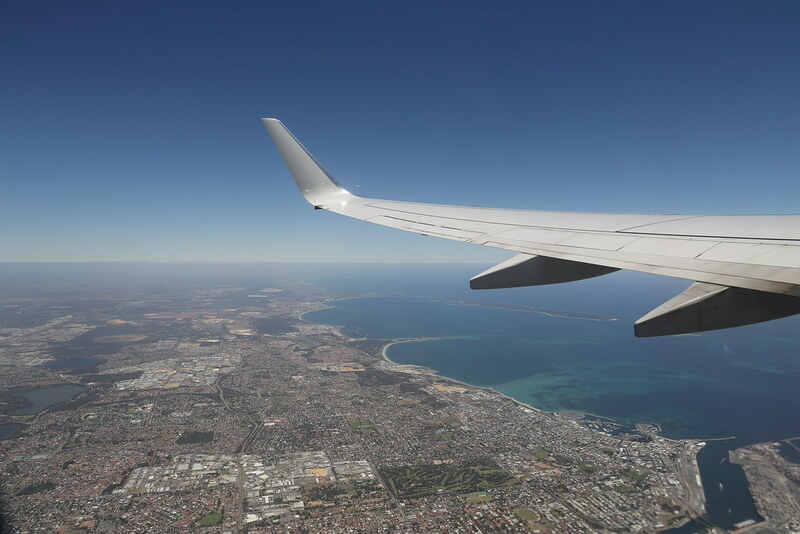 The check in agent was helpful and asked if I had transited in Perth before, telling me the procedures to get from the domestic to international terminals. Boarding soon commenced and was boarded by row numbers, which I’m not sure many people payed attention to. 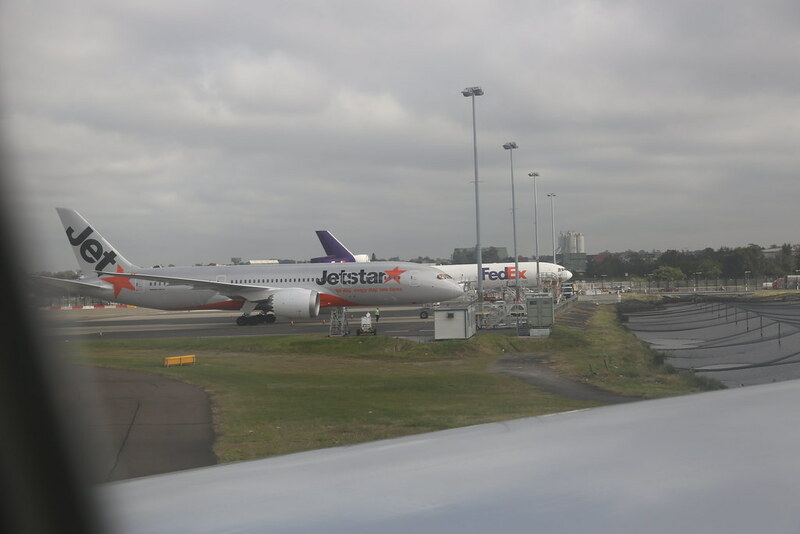 I arrived at my seat at the last row of the forward cabin and stored my bag in the overhead locker a few seats forward as the bins at the last row was filled with blankets. We pushed back about 20 minutes late due to paperwork from an earlier tyre change. The safety demonstration does not stream to the iPad’s and they cannot be used mounted in the seat back for take off and landing. 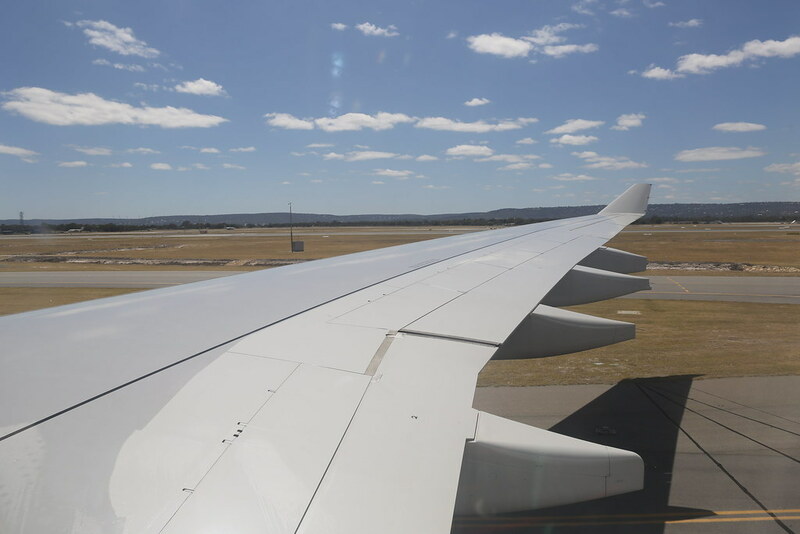 It was a very short taxi to runway 16R and after waiting for a couple of landing aircraft we blasted off for Perth. Linked below is a video of the take off. Breakfast service soon started. Menus are not distributed in domestic economy. 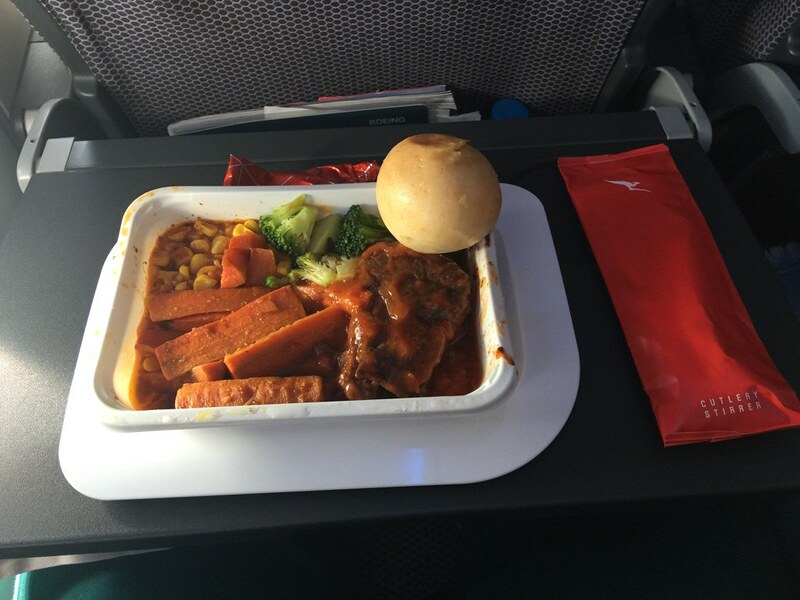 Service was relatively fast, as food boxes are now used on domestic routes instead of meal trays. This simplifies and speeds up the service and is very useful on shorter sectors. The options for breakfast were muesli or a hot breakfast. 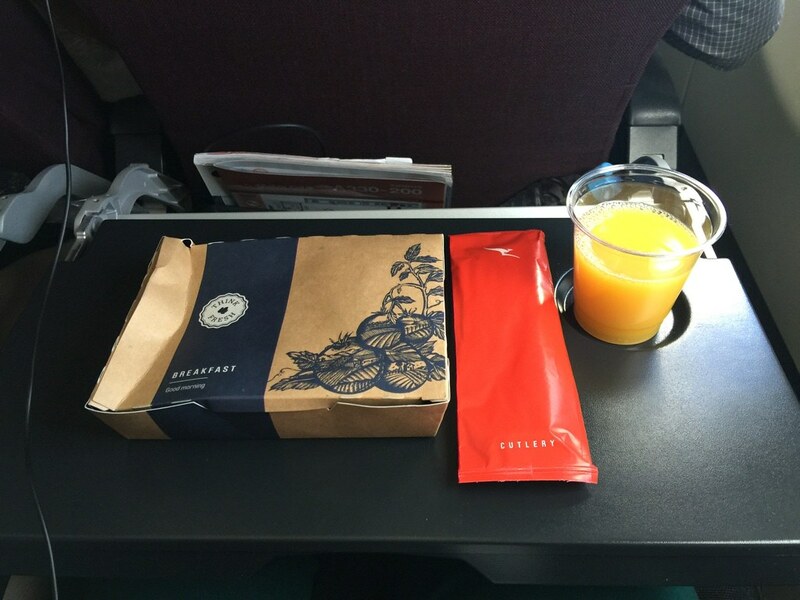 I selected the hot breakfast, accompanied with an orange juice. The hot breakfast contained scrambled eggs, bacon rashers, two hash browns, a sausage and a roasted tomato. Overall it was a decent meal and the eggs unexpectedly were not rubbery. My only complaint with the meal was the hash browns, which were very soft and kept breaking apart. Up to this point the iPad’s would not connect to the network and it really showed the shortcomings of the “Q-Streaming”. The cabin crew finally fixed the problem after multiple resets and apologised over the PA. I would think that having an IFE installed into the seat or having content installed directly onto the iPad wouldn’t cause as large a disruption as each seat can be reset individually or swapped out for a spare iPad. I would also like to see a flight map on the iPads, something I missed from traditional IFE systems. The selections of movies and TV shows were also vastly different to the international aircraft and there was a smaller selection. 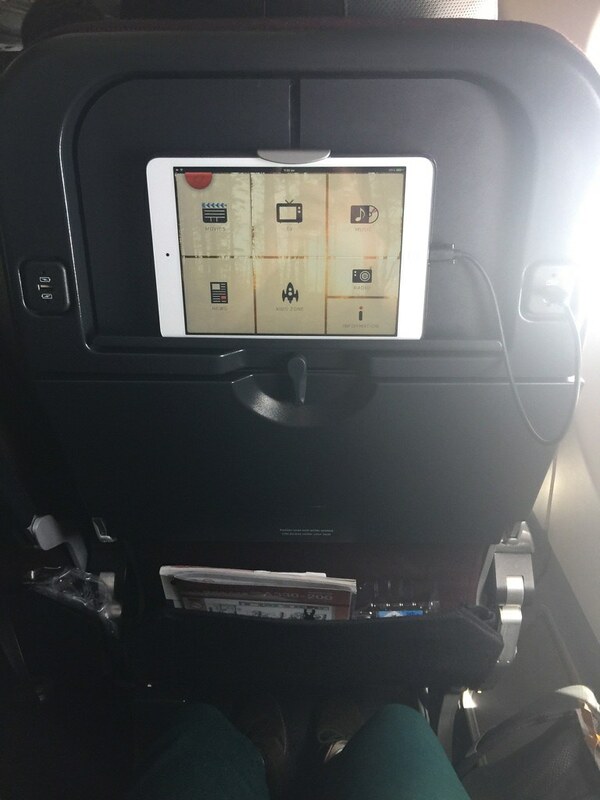 Headphones also connected directly to the iPads, which unlike traditional armrest ports causes a small inconvenience when letting someone out from the middle or window seats. The iPads were also relatively unresponsive and slow compared to a normal iPad. 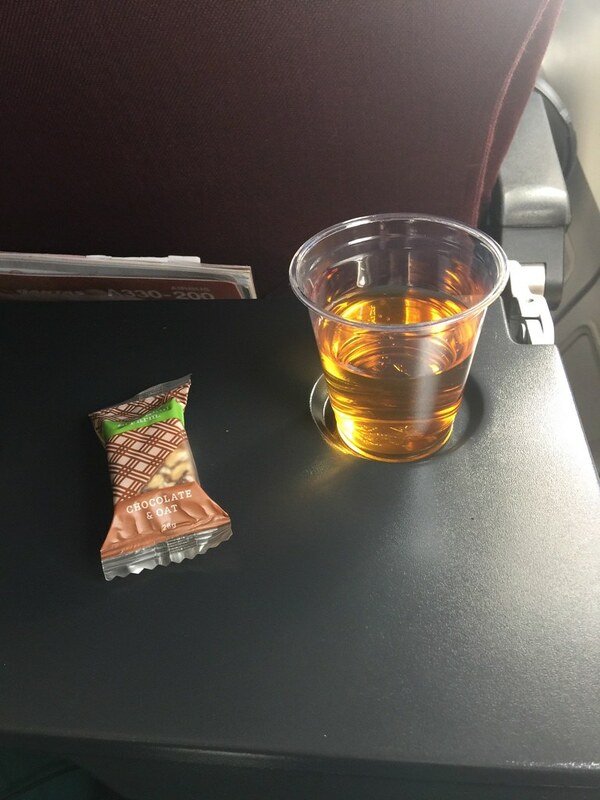 Midway through the flight a small snack was offered, consisting of a chocolate and oat bar. Drinks were also offered and I opted for an apple juice. A quick walk around the cabin indicated that the load was good with only a few empty seats scattered around the back. Seat 39K is the last row of the forward cabin, with the lavatories directly behind. 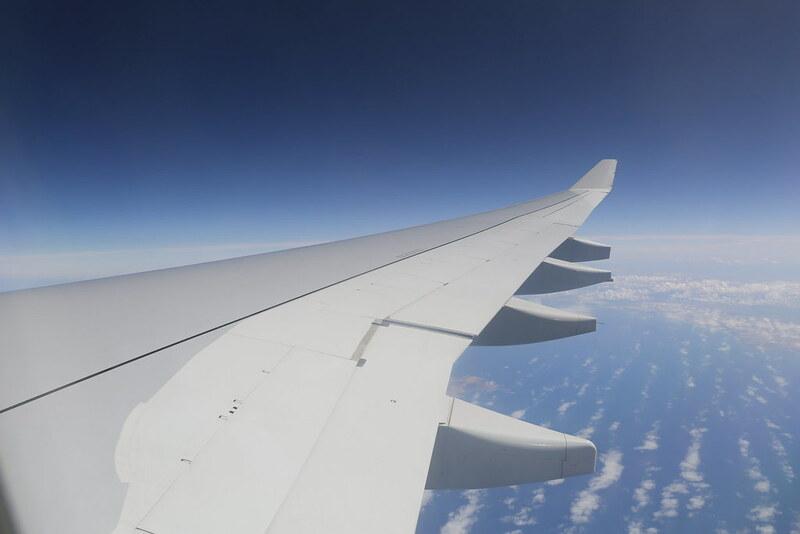 The constant flushing isn’t too annoying during a daytime flight, but may be disturbing on a night flight especially when trying to get some sleep. 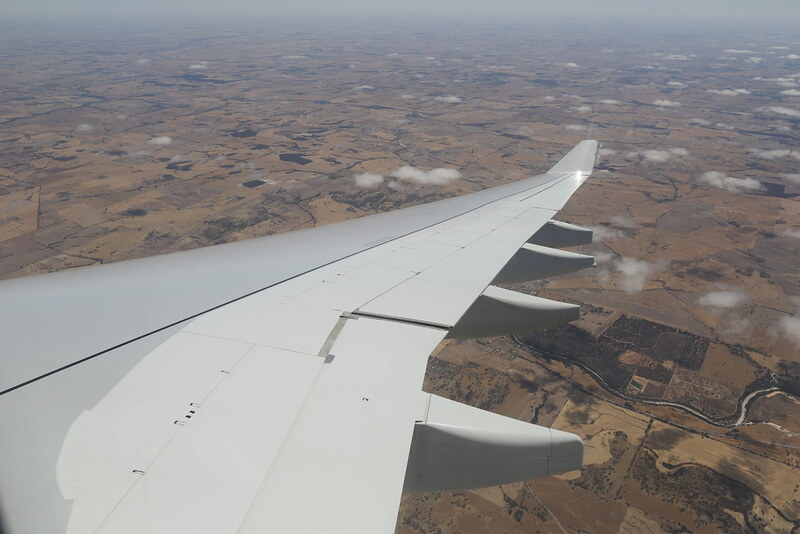 As we started our descent, the captain informed us that we would be slightly delayed due to high traffic at Perth. The ride became rougher as we flew lower and on final approach the gusty winds were very apparent. Linked below is the video of the landing. Exiting the aircraft was an orderly affair and I was soon inside the terminal. Having never been to Perth before I looked around any quickly found my way out. As you exit the airside area there was a sniffer dog to detect food, plant products, animal products and fruits and vegetables. Many agricultural items from other states and territories cannot be carried into Western Australia and some are only allowed with a permit. 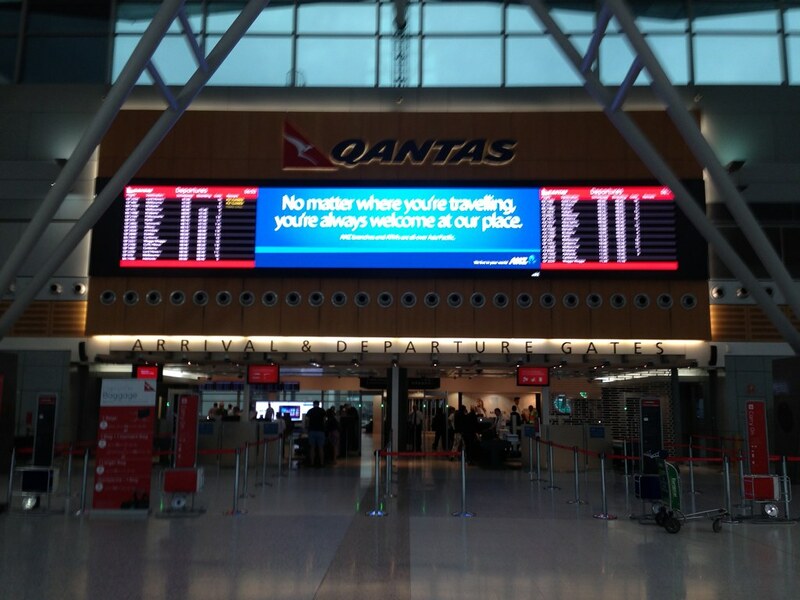 The Qantas domestic terminal and the international terminal at Perth are located on opposite sides of the airport. To transfer between them a shuttle bus is provided free of charge providing you have an onward boarding pass, although the driver didn’t check. Signage for the international connection bus was almost non-existent and I ended up at the wrong bus stop. 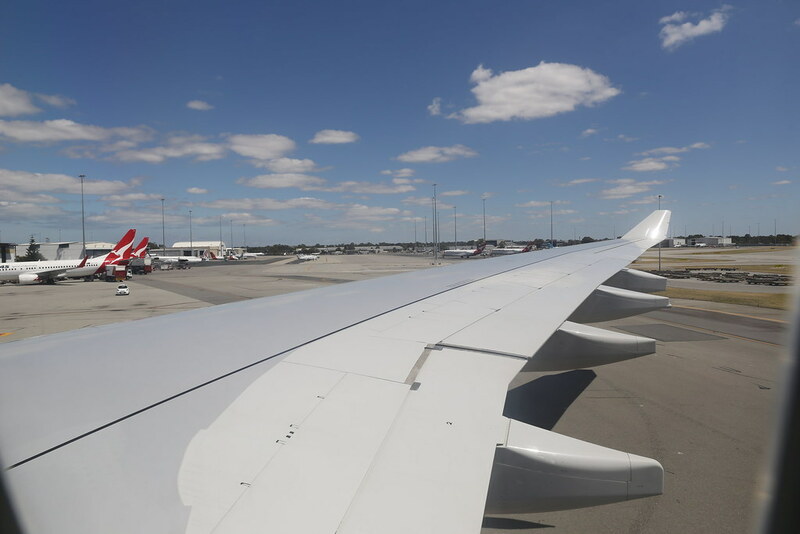 After asking a member of Qantas staff I was redirected in the right direction where buses to the other terminals and the external car park were located. The bus operates every 15 minutes, which compared to other airports passenger transfer systems is a very long time. But considering the low volume of traffic going through Perth it is understandable. Luckily for me I only had to wait about 5 minutes. The bus had a dedicated area for baggage as expected and we were soon on our way to the international terminal. I was expecting a slow ride but thankfully the road linking the terminals has a speed limit of 100km/h. 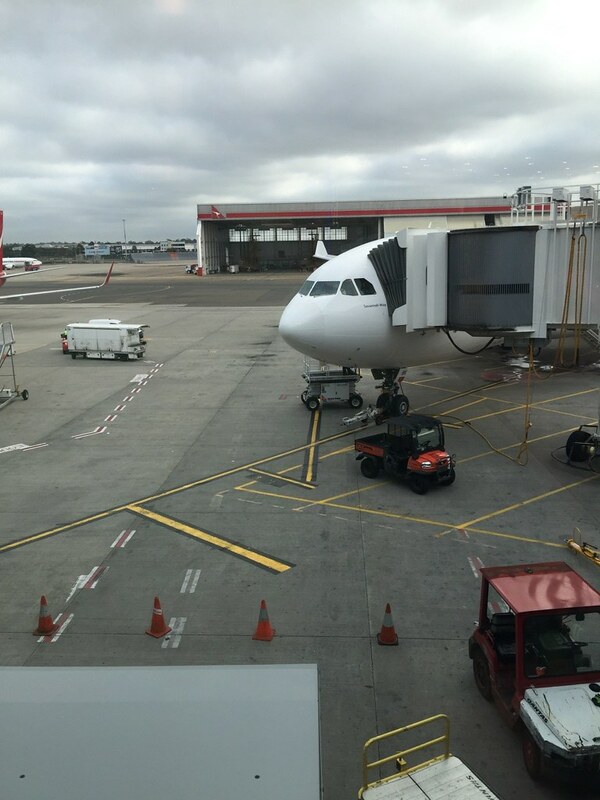 We quickly reached the Virgin Australia domestic terminal and before long we were at the international terminal. There was construction works outside the terminal and there was only a small passageway from the bus stop to the main building. Inside the building things got worse. As I haven’t been to Perth before I relied on the signage to guide me to the departure area. But the directions were horrific and quite useless. The signs directed me on a much longer walk then required, almost doubling the distance and ending up in an area very close to where I entered the terminal building. The terminal was very empty and immigration was only manned my two people, both of which were free when I entered. Security was also completely empty and I cleared it in no time. Like all other Australian airports that I have been to there was a duty free maze after security before reaching the gates. Boarding commenced a few minutes later then stated and was again called by row numbers, which as usual not many people followed. 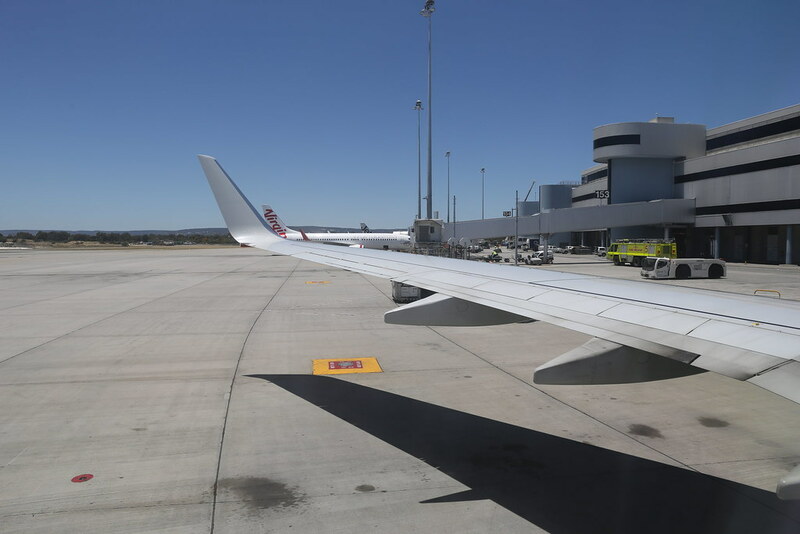 At Perth you have to walk down a flight of stairs before reaching the jet way, which can be troublesome for less mobile people. Upon reaching the aircraft there was a line to board as expected on a fully loaded single aisle aircraft. When I finally reached my seat I found the overhead lockers to be quite full and I needed to squeeze my bag in. The promotional pictures of the 737 Sky Interiors enlarged pivoting bins seem greatly exaggerated and in reality I think more things can be stowed in the older shelf type bins. In my opinion the promotional pictures of the overhead bins represent an ideal world where all passengers carry the same sized roll aboard. Whereas in reality bags come in all different sizes and not all conform to the maximum dimensions allowed. I proceeded to settle down in my seat and found the legroom to be very tight and really not sufficient on a medium haul route, or on a full service airline. I’m only of average height and can only imagine the suffering of taller people. 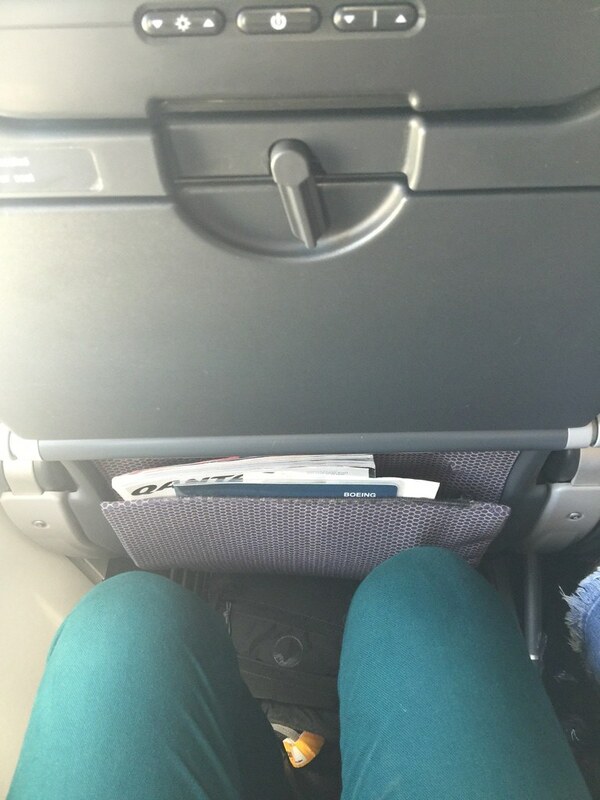 My knees were almost touching the seat in front of me and I was seated a far back as I can. To add to the misery my seat couldn’t recline. 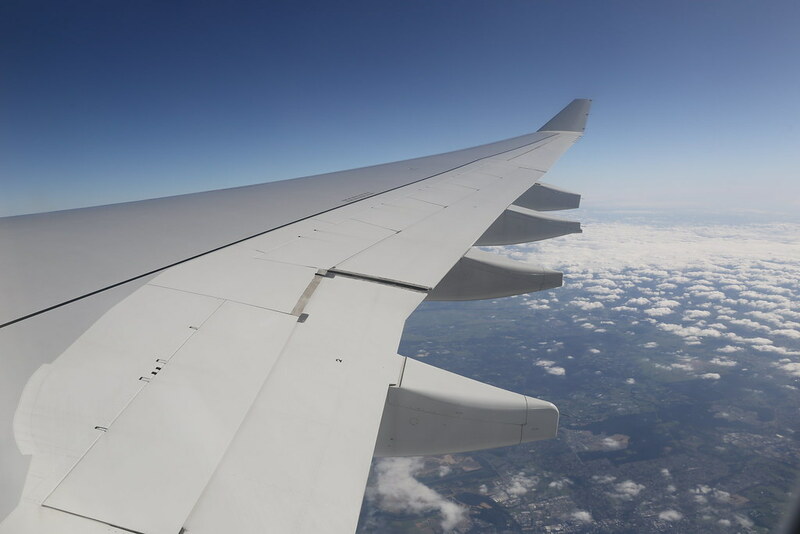 Storing a small bag under the seat also greatly reduces space and unlike larger aircraft there is absolutely no space near the sidewall to place bags during cruise. 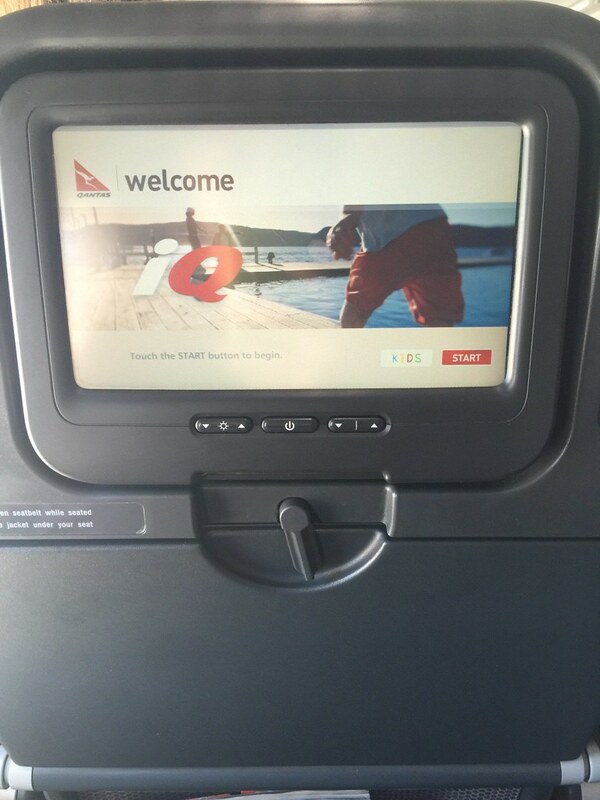 The IFE system is adequate and has the largest selection of content amongst my three flights. But since the 737’s are mostly used for short domestic sectors I cant understand the need for such a complicated system. Surely “Q-Streaming” is a much cheaper and economical option. The sky interior windows do make a difference and the simple re-sculpting of the frame give the effect of the windows being larger then the non-sky interior 737’s. We pushed back on time and for the first time this trip I saw the safety video. After a long taxi to the runway we took off in gusty conditions. I could feel the constant directional corrections to maintain the centreline. Linked below is a video of the take off. There was no welcome drink as stated on the menu, except for bottled water, but the views on take off more then made up for it. The lunch service soon commenced but only one trolley for food and one for drinks were used for the entire economy cabin. As a result of this the service was extremely slow and being seated near the back didn’t help. I had pre-selected the beef option but like the last time I tried the “Select on Q-Eat” service the crew made no acknowledgement of the pre-selection and asked what I would like to have. The garlic bread was soft and warm, but the main left much to be desired. The beef was tender and fell apart, which is surprising for reheated beef but the vegetables and the sauce wasn’t great. The sauce was way too overpowering and everything had the same general taste. The carrots and broccoli were mushy and soft, and the corn salsa tasted more like plain corn. The service with one food and one drinks trolley also presented another problem as the drinks cart severely lagged behind the food. By the time I was offered drinks I had finished more then half my meal. 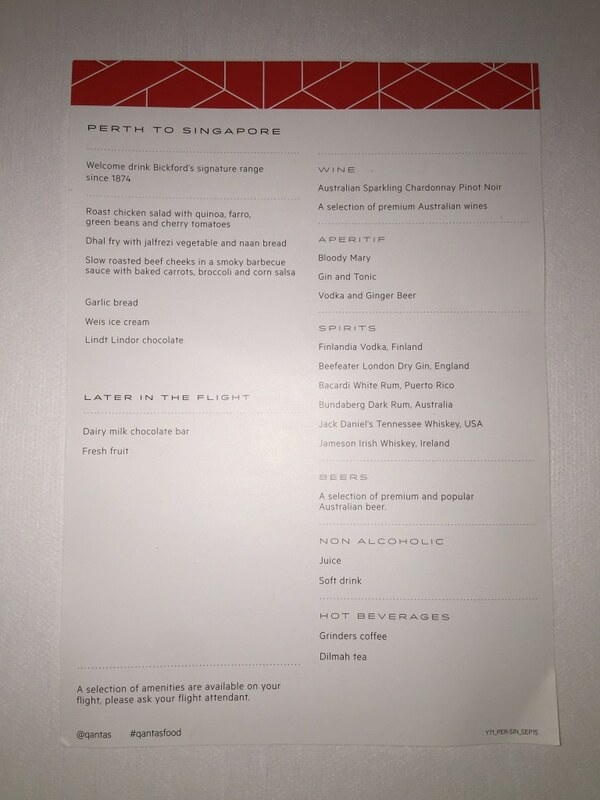 Never the less Qantas still has a wide selection of drinks, and I opted for a red wine. The wine is packaged in what looks like small glass bottles, but are in fact plastic. They are also served with plastic cups not glasses like the old days. I’m no wine expert and I base my opinions on wether I would drink it again. 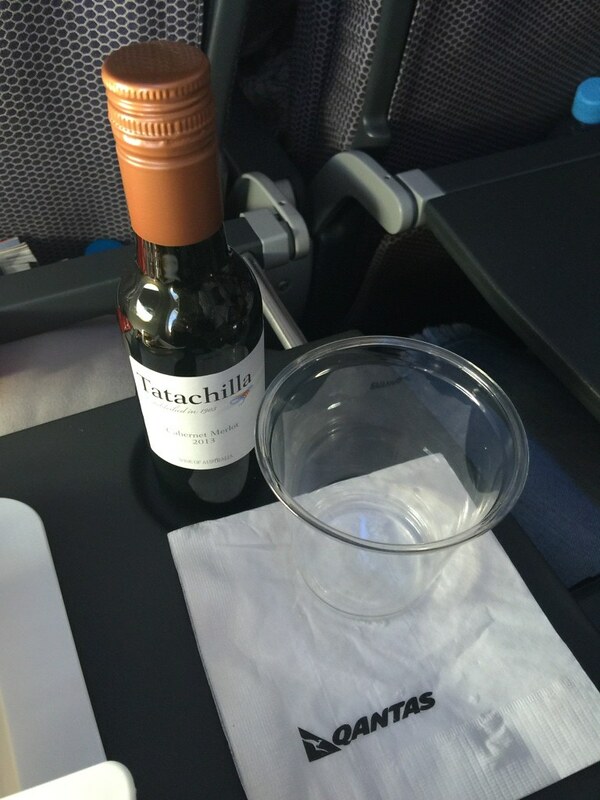 For me the Tatachilla Cabernet Merlot 2013 isn’t fantastic, and due to the sharp taste I wouldn’t select it again if there were other options available. Crew then started to distribute dessert, a Weis raspberry ice cream bar. 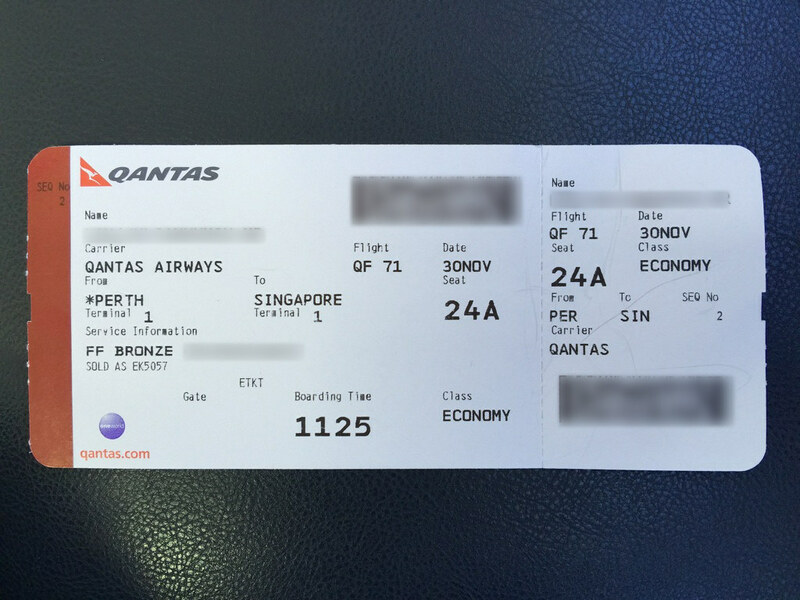 It was handed out by one flight attendant, starting from the front. So unfortunately for me it was already starting to melt by the time I got one and I didn’t have time to take a snap. Once the lunch was cleared the usual rush for the toilets occurred, and a long line started to form. The two toilets at the back were clearly not able to handle the full load of a 156 economy passengers. Also being a single aisle aircraft there was a tremendous amount of squeezing as passengers and crew tried to get past each other at the back of the plane. After about an hour the crew then proceeded with a chocolate and fruit service consisting of a small Cadbury dairy milk chocolate bar and apples. 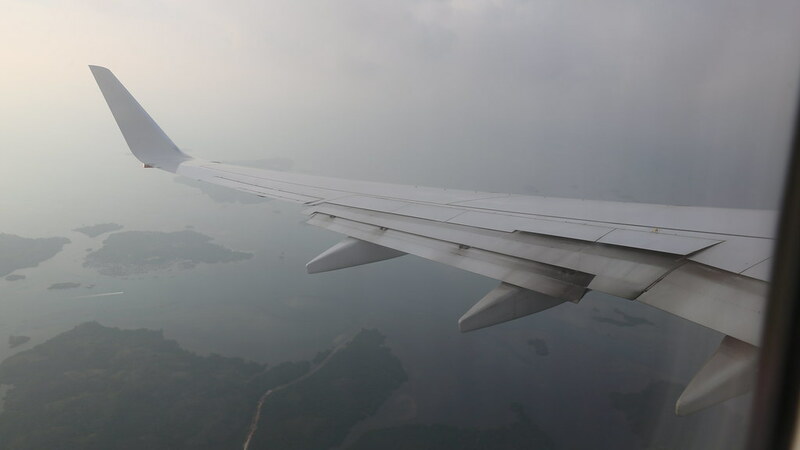 As we neared Singapore the captain informed us that due to bad weather and high traffic at Changi we would have to hold for around half an hour. On the flight map our path indicated that were flew multiple racetracks before the weather eased up and we made our approach. 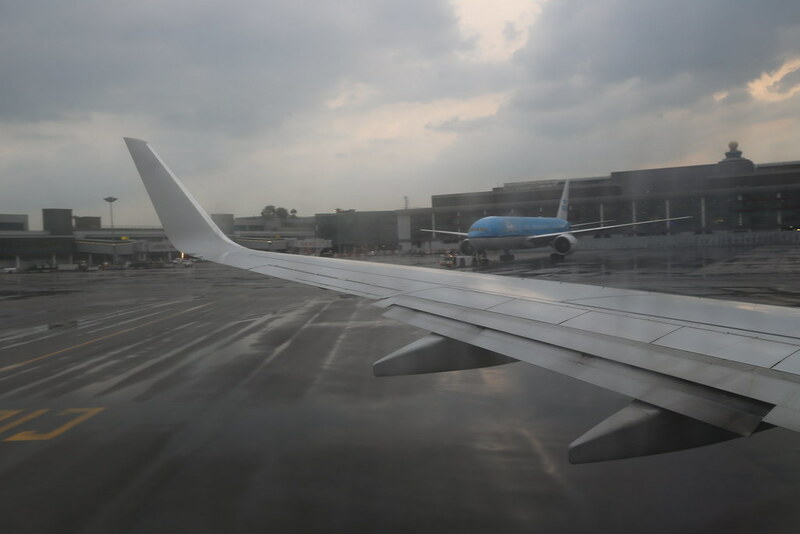 Our final approach was slightly bumpy and upon touchdown the reversers kicked up a lot of spray as we braked hard. Linked below is a video of the landing. Parking at our gate with a KLM 777 pushing back for departure. Deplaning took longer then usual but once I got out I made my way to immigration, which as expected from Changi, was smooth and efficient. Baggage claim was very fast and my luggage only had a small amount of water on it from the rain, due to the covered bag carts that Changi uses. 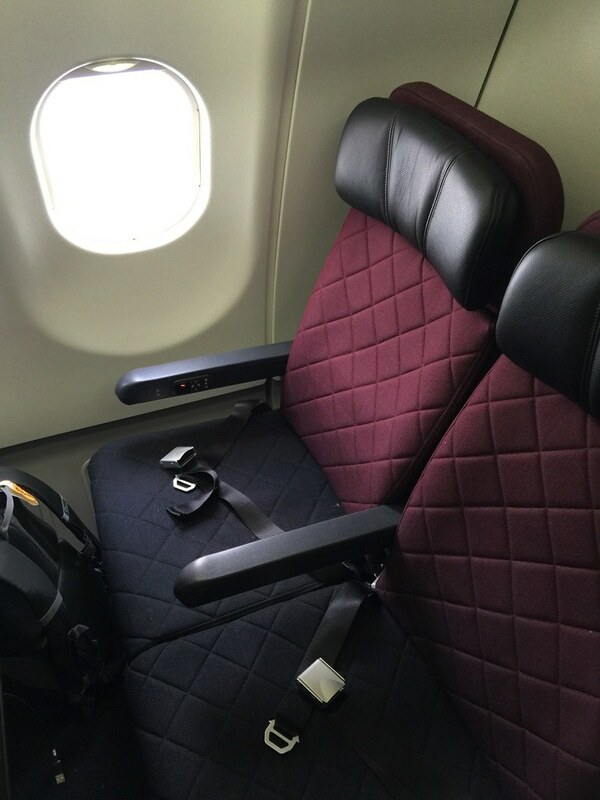 Qantas’ new A330 seats are a vast improvement from the older product and it should achieve more consistency across the fleet. 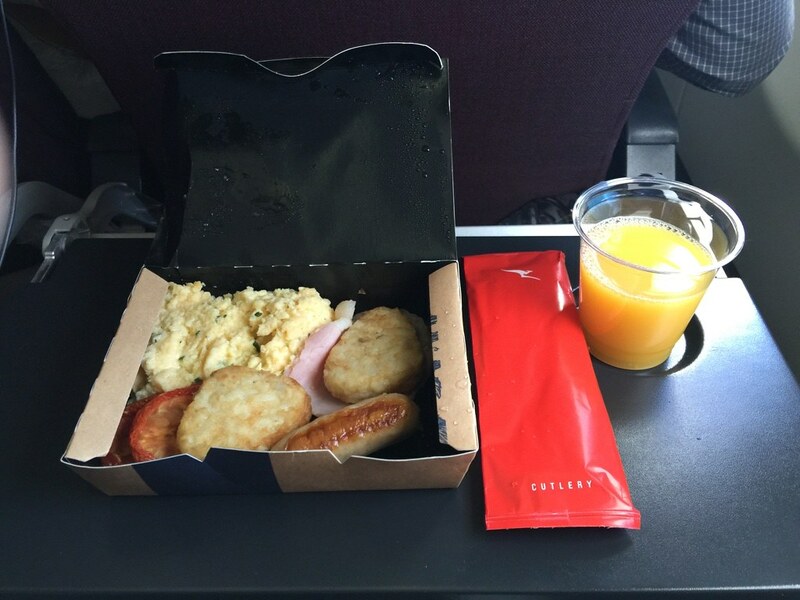 Using boxes instead of trays on domestic sectors makes sense, as the majority of the flights are less than 2 hours. 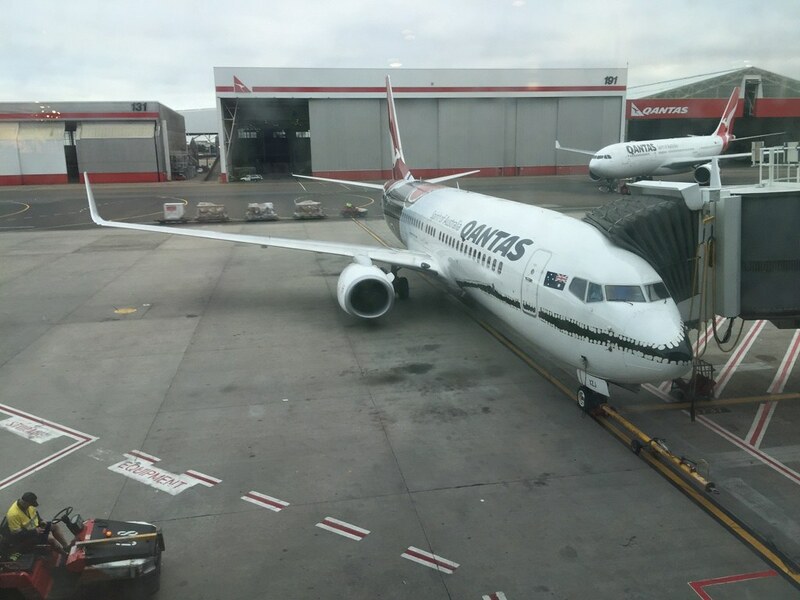 The coast to coast war between Qantas and Virgin Australia has clearly benefitted the passengers as each airline strives to outdo each other. Transiting in Perth, like the other major airports in Australia (except Melbourne) is troublesome but the bus is quicker then expected. Signage at both the domestic and international terminal needs a drastic improvement as it currently leads passengers unfamiliar with the airport on a wild goose chase. 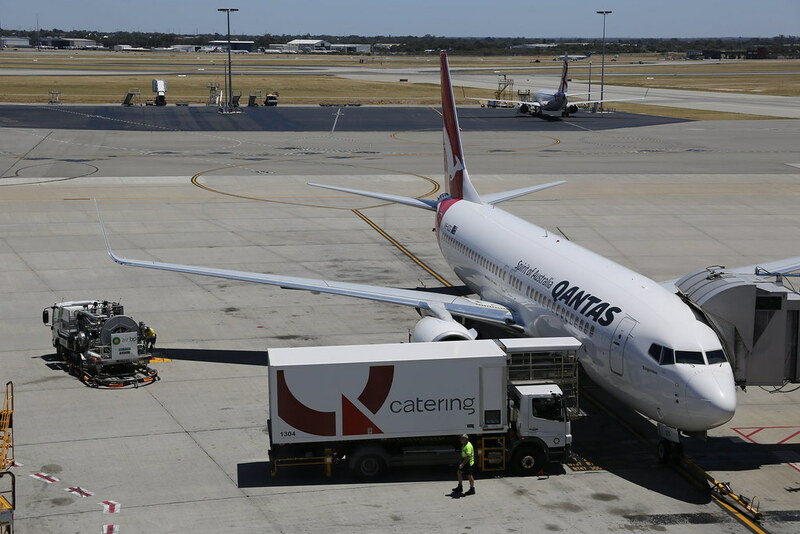 I am happy for Qantas that they have found a profitable way to fly from Western Australia to Asia after cancelling all international flights from Perth earlier in the year. But after flying a cramp 737 for 5 hours I wouldn’t fly this route with them again unless I had no other option. I would much rather fly from any of the east coast cities with an A330. Please feel free to share your opinions on my report, I always look to see what I can improve on and add to, for future reports. Great report again Julian. I agree with your thoughts on the domestic-international transfer at PER.